Halloween is fast approaching and many of us are looking for something a bit different to do. But at the same time we don’t want to spend a small fortune, and also for most of us Halloween this year is during school term time so that limits our options too. 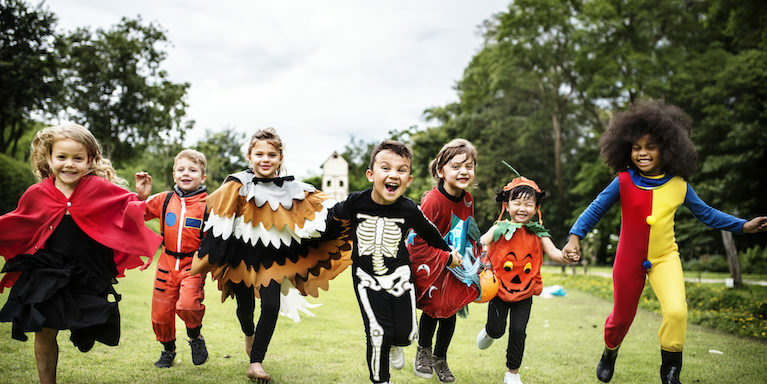 So we’ve put together a list of ten fun things that you can do with the kids this Halloween that don’t take up too much time or effort or money but that everyone will enjoy anyway! Children will really enjoy helping to decorate the house for Halloween and you can achieve a lot from everyday items rather than forking out for special decorations. For example you can make little ghosts from plastic cups, skeletons from paper plates and spiders’ webs from swing bin liners or cotton wool. Light plenty of pumpkin lanterns and candles to create a lovely spooky atmosphere. Get everyone together in the dark and take turns to tell your spookiest story. Even better if you can pre-arrange some spooky special effects such as creaking doors or mysterious figures appearing. Everyone loves a good party game so why not resurrect some of old traditional party games. 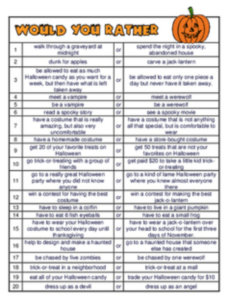 The main one that everyone things of at Halloween is apple bobbing, but there are many other traditional party games that could also easily be adapted to a Halloween theme. Just think of games like musical statues, musical statues/bumps/chairs, pass the parcel, pin the tail on the donkey, treasure hunts: and of course not forgetting Murder in the Dark! Slime is so popular anyway with kids at the moment that allowing them to indulge for Halloween is bound to work! Why not have tubs of slime outside – and perhaps mix in a few extra horrors like plastic spiders and other little creatures. Light up the scene with lots of pumpkin lanterns. Having this activity outside will keep the mess where it’s easy to clear up and because of the cold and dark will also limit the time that they get to spend on it. It’s good fun for your kids to go out trick or treating but make this early in the evening so that they don’t get overtired and don’t annoy other people. Also make sure that you have treats in at your own home for when trick or treaters come to you. It can be expensive to buy special Halloween sweets but most supermarkets will be doing offers on tubs or multi packs of sweets; or you may want to have a go at making something yourself. If you are going trick or treating it is possible to have good costumes without spending a small fortune. You can often find great bargains on eBay or a charity shop, as man costumes get worn once then got rid of. Or why not swap costumes with other families or make something yourself. If you do decide to make something then check out sites such as Pinterest to get some brilliant ideas. Most Halloween favourites such as ghosts, mummies, zombies or skeletons can be created quite easily out of old bedding or towels and marker pens. A fun activity – or perhaps an alternative to trick or treating – is to create your own pinata. You could make a simple ghost pinata quite easily by filling a balloon with lots of sweets, inflating it then wrapping with layers of toilet roll. The children will have great fun trying to destroy it then eating the sweets that come out of it. A cheap and easy way to occupy a group of kids for the evening once the trick or treating and the rest of the fun is over is to all sit down and watch a spooky film. Aim for something that is suitable for the youngest child, and everyone is bound to enjoy it – even if they pretend not to! You can all snuggle up with either some popcorn or the fruits of your trick or treat labours and enjoy being scared. But not too scary – then it’s a great way of calming everyone down at the end of the evening. We hope that you have a happy Halloween and that the above ideas help you and your family to have great fun without spending too much money in the process. Check back here soon for more money saving ideas from Loans 2 Go.